Columns are as old as civilization: for thousands of years, they have provided architects and engineers with a simple and sturdy solution to support heavy loads while leaving room to move around on the ground below. 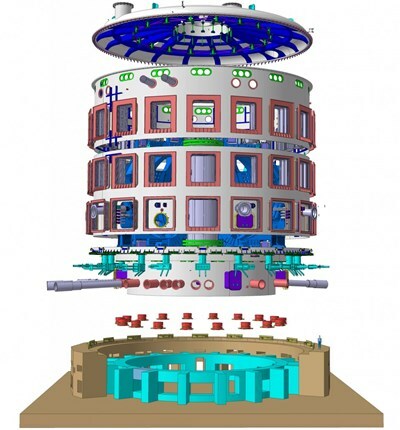 This traditional and reliable solution was to be implemented in ITER: a circular arrangement of 18 steel columns was to support the cryostat ring—the thick steel component that acts as a mechanical interface between the combined mass of the cryostat and Tokamak (25,000 tonnes) and the Tokamak Complex basemat. Columns do a great job supporting large, static loads. However under particular circumstances during ITER Tokamak operation, mechanical, magnetic, or thermal loads, singly or combined, could add up to generate considerable stress on the columns. Once refined, models and simulations showed that under certain conditions the load transfer to the basemat by way of the columns was not totally satisfying. For ITER Safety Security and Quality (SQS), this was clearly a potential safety issue. "As the Tokamak Complex basemat could not be modified, it was imperative to develop an alternate solution to the columns. In this, the expertise of Design Integration Section was fundamental," explains head of the ITER Licensing Cell Joëlle Elbez-Uzan. Thus began, early in 2012, a ten-month collaborative effort involving ITER's Safety, Quality & Security; Building and Site Infrastructure; Technical Integration; Cryostat; Assembly; Safety; and Magnet teams, as well as the European Domestic Agency F4E and their Architect Engineer, Engage. "The light eventually came from Engage's design project leader, Peter Sedgwick," recounts ITER's Nuclear Buildings Section leader Laurent Patisson. "He suggested we mobilize the resistance capacity of the three-metre-thick concrete bioshield wall that surrounds the cryostat—something we had not fully investigated ..."
The exceptionally thick and strong bioshield, which stands approximately three metres away from the cryostat, held the solution indeed. "The idea is to replace the 18 steel columns with a concrete 'crown'. Every 20 degrees, the crown would be connected to reinforced concrete walls radially anchored into the bioshield. It's a clever and efficient solution to distribute the efforts evenly..."
Faced with a similar problem, the architects of Notre Dame Cathedral, in the 13th century, developed a similar solution. "By positioning flying buttresses at regular intervals around the Cathedral's nave, they were able to evenly distribute the loads of the edifice's walls, explains Joëlle. 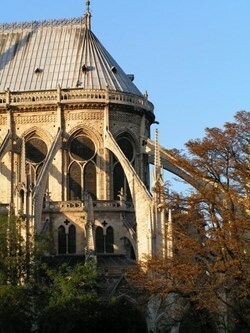 By positioning flying buttresses at regular intervals around a cathedral's nave (here Notre Dame de Paris), medieval architects were able to evenly distribute the loads of the edifice's walls—a solution that is similar to the one devised for the ITER cryostat support. In the ITER Tokamak however, every design modification is bound to impact other components. Designers soon realized that one of the radial walls connecting the crown to the bioshield was competing for space with the magnet feeder for poloidal field coil number 4. An early option called for compensation by way of a set of concrete beams. "However such a singularity in the crown support system would have made the structural capacity demonstration difficult," explains Laurent. Working closely with the Magnet and Technical Integration Divisions and the Building & Site Infrastructure Directorate, a solution was eventually reached, which resulted in the proposed cryostat support system regaining its symmetry. All in all, as stated in the preliminary assessment on the capacity of the new cryostat support, the new design "could result in a more integral and compact solution, with many potential advantages from a mounting and constructability point of view, as well as from a global structural capacity perspective." The cryostat ring and the concrete crown that supports it would be connected by way of an arrangement of 18 spherical bearings acting like ball-and-socket joints. Such bearings, which are also used in large bridges, allow for the smooth transfer of horizontal and rotational forces. Needless to say, all these components will have to retain quality and functionality in a rather harsh environment, where radioactivity will be high and cold very intense—reaching -100°C in the vicinity of the cryostat ring. ITER Safety Security and Quality and Buildings & Site Infrastructure are now preparing the Support Robustness Demonstration document, which will be submitted to the French Safety Authority (Autorité de Sûreté Nucléaire, ASN) in January. When the Demonstration is validated, work will resume inside the Tokamak Seismic Pit where the 1.5-metre-thick Tokamak Complex basemat will be poured.